Holy Moly! I survived ONE WHOLE WEEK!!! I never thought in a millions years I could do this, but you know what? When I put my mind to something I get it done. I still have 2/3 to go, but 1/3 done with this cleanse!! Tomorrow starts 6 days of no meat though. I have never, ever done this in my life either. I wonder how it will go? I surely hope I am not hungry all the time. I did spend about 2.5 hours today meal prepping for the week (more on that later on). Like I mentioned yesterday I'm house sitting. I slept good last night, but I kept waking up every 2 hours for some reason. I wanted nothing more than a hot cup of coffee this AM to get me going, but my decaf had to do. Now I'm out of it and will have to stick with herbal tea for the remainder of the time that I'm here (I'm too lazy to go buy any more decaf K-cups!) And, the tea is better for me anyways! I started my day off with a great yoga class this morning. Nothing like a good stretch to end the week. Lunch: 1 turkey burger with some mustard, 1/2 cup jasmine rice and 1 carrot. Dinner: Wild Mahi Mahi baked filet and 1/2 cup jasmine rice. Dessert: 1 scoop OptiCleanse GHI vanilla protein powder mixed with water. Todays calories: 1222 (I had some nuts that I didn't count, nor the honey)--40% Carbs, 22% Fat and 38% Protein. Tomorrow I'll weigh myself at Team AfterBurn and I hope to be down a few pounds. I feel like I am!! Homemade Pesto: pine nuts, extra virgin olive oil, basil, lemon and garlic. I've never made fresh pesto before, it's delicious. A giant tub of salad that I can dish out to bring salads this week. What's in it? Organic romaine lettuce, organic baby spinach, jicama, cucumber, mushrooms, chickpeas, carrots and radish. I'll dress it with Bragg's Healthy Vinaigrette dressing. And last, I made a healthy pasta dish. 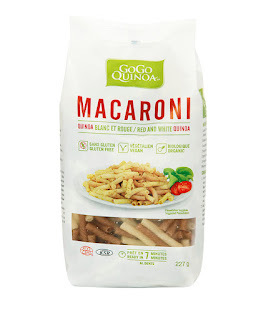 I found this awesome quinoa macaroni pasta at Costco and it looked so good and it's organic. So I boiled some up, mixed it up with the homemade pesto I made and then tossed in some onion, cucumber, celery and jicama. Sounds delicious to me! Till tomorrow--hope your weekend was amazing! Disclaimer: I am not a physician or a health care practitioner. This site is not meant to provide medical or health advice of any kind. Do not misconstrue any information that you read here as medical recommendation, diagnosis or treatment. The information provided here on this blog is intended to serve as a communication of my experience as a medical student and to share articles and public material pertaining to health that I come across. It should in no way be interpreted as medical advice of any kind.